Catholic League, and Public League A and B teams have one or two games left before playoffs. Division C teams are done and are set up for the playoffs. A post about the playoffs will appear later this week. When Kensington and Ben Franklin faced off Friday, Oct. 11, it was the only two undefeated going head to head. Kensington found one in the first half, and both teams scored 2 in the second, for a 3-2 result Kensington. Jhon Pino had two goals for Kensington, one from twenty five yards out, and another from a free kick. The result represents the fruition of many years of work for Kensington which has nipped at the heels of promotion but never sunk its teeth in for an actual taste until this year. Both teams will go up to B Division next year. New Foundation Charter School was competitive this year as well. As you can see in the table below, at the bottom of the division are Penn Treaty and KIPP, but both teams are fielding their first varsity teams. One interesting measure of a program is whether or not they managed to play all eleven games. For instance, Penn Treaty had the organization and fortitude to play all eleven, while NFCS, with a much better record, managed not to play a couple. One possible explanation is that teams chasing playoff spots ensure that they are handed forfeits when other less organized teams fail to play them. St. Joe’s claimed a big result on Oct. 8, handing Lansdale their first loss. La Salle pushed an unanswered seven past McDevitt. Judge scored five against Bonner, while Ryan and Wood fought to a 1-1 draw. On Oct. 9, Roman forced five past McDevitt. 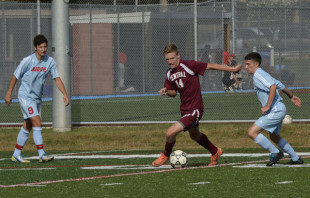 St. Joe’s added another win on Oct. 11, beating Bonner 2-1. O’Hara beat McDevitt 4-2. On Oct. 7, the School District, cowed by the improbable reports of a tornado, canceled all after-school activities. Frankford and Masterman faced off on Wednesday, Oct. 9. Masterman was up 2-1 at the half, but Frankford equalized and the game ended 2-2. In a game that will likely have playoff implications, Fels beat Bartram 1-0. Washington claimed a scalp by beating Northeast 1-0. Stefan Koprivicia scored the game winner in the second half. Central beat FTC 3-0, with Jason Pixley finishing two goals and supplying the assist on the other. On Oct. 10, Central slopped with Masterman through the rain and mud on the way to a 6-0 victory. FTC found an important win of its own on Saturday, Oct. 12, beating Bartram. Chris Hammerstein had two goals, and Matt Hartman had one, for a 3-0 result. Washington faced No. 3 Prep Charter, winning 1-0 again. Two wins on the week push Washington up to the middle of the table. A look at the standings shows that Olney is the likely first place finisher. I happened to drop by an Olney practice and the team shows speed, tenacity and some technique. It will be interesting to see what they pull off in the playoffs. He also corrected me. Penn Treaty had no program this year.